The reverse design, by United States Mint sculptor John Mercanti, features a striking heraldic eagle with shield, and olive branch in the right talon and arrows in the left. 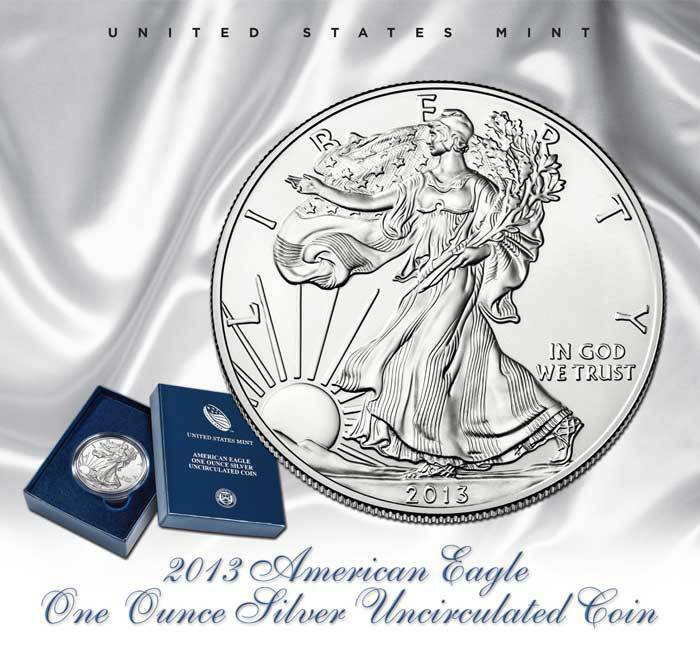 The 2013-W American Eagle Silver Uncirculated Coin is encapsulated in plastic, placed in a protective outer box, and accompanied by a custom-designed Certificate of Authenticity. The release of the 2013 burnished silver eagle marks the sixth coin of this series since 2006 (the inaugural year), with the 2009 and 2010 issues completely skipped by the US Mint (none were minted) due to unprecedented demand during those years for the regular issue bullion silver eagle. The series resumed in 2011 when the US Mint was able to acquire sufficient planchets (coin blanks) for both the regular bullion coins and the special edition burnished coins.